Our account managers have the knowledge to advise the best solutions for your washroom. Our roller towel cabinets are available in a range of sizes and finishes, designed to be functional yet attractive and suit every environment. The 100% cotton toweling ensures the product is convenient, strong, absorbent and produces no waste. All roller towel cabinets are anti-jam ensuring they are hassle free. We will replace the towels at agreed intervals to ensure this is a hygienic process. 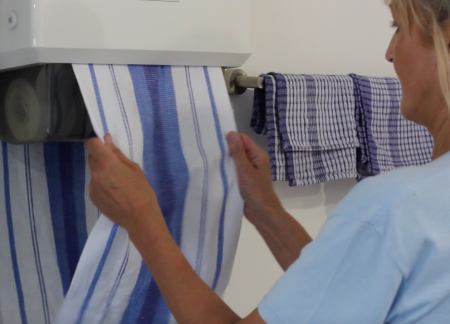 Giltbrook’s laundered towel service is the easiest and simplest way to guarantee a constant supply of clean, fresh towels to your business.